Exhibit A: David Hemmings, born 1941. Top, in Blowup, 1966. Bottom, at the Gladiator premiere in 2000. Breaks the heart, doesn't it? My god, he was a thing of beauty in the 60s. By the mid-70s he was looking like crap, which doubtless is part of why his film career hit the skids. He said, "People thought I was dead, but I was just directing The A-Team." "People thought I was dead, but I was just directing The A-Team." So in essence, people were not wrong. I was watching Dolores Claiborne and had the horrible thought that Jennifer Jason Leigh bore some resemblance to the young David: downturned mouth, eyebrows and pouty look on her face. eek! no, not Jennifer! But you have a point, there is a resemblance. But she need not share his fate; women tend to be less profligate with their looks. Pardon the free associating, but I was watching TIME WITHOUT PITY last night and I couldn't help but think how much Michael Redgrave reminded me of M. Hulot. 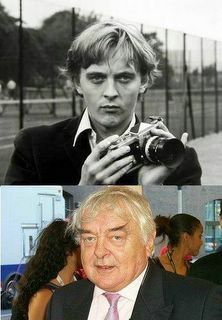 David Hemmings was an amazing person: multi-talented and prolific. We all grow old and most lose our looks... I'm sure none of the people giving their superficial "comments" above, have or will ever be able to aspire to a fraction of what David Hemmings accomplished during his life. It's a shame they can't see the beauty inside someone.